The Husband and I were down with a stomach virus last weekend and I missed work this past Monday because of it. I blame it entirely on him - he started it. In all fairness though, he got the worst of it. I did manage to use the time to work on a new sock design. Which brought me to toes. After much swatching (I know, you can’t believe it either, can you?) 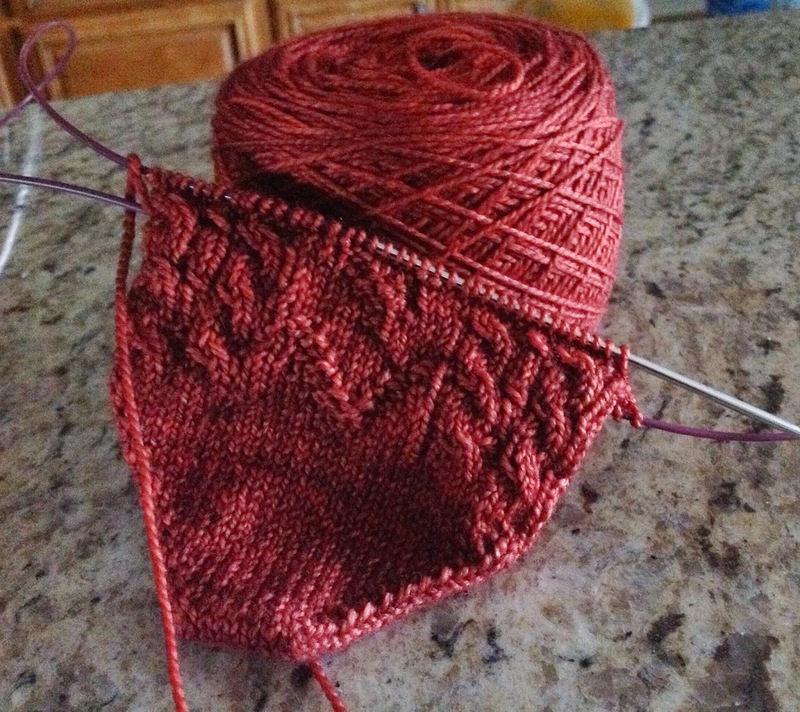 it became clear that one part of the stitch pattern I’m working with will only look right if I knit from the toe up. The pattern would be upside-down if I used it cuff-down. Yes, I did reverse-engineer the pattern but for whatever reason, it just didn’t look right. In theory it should have been perfect. It wasn’t. Since I love the particular stitch pattern in question (it was the inspiration for the project in the first place) it became obvious that I would need to learn what I’ve been putting off ever since I started knitting socks - working from the toe-up. I’ve played around with toe-up before, but never seriously. Part of the problem is that Judy’s Magic Cast On (which is awesomely superior to any other method) works best using Magic Loop and since I’m generally a die-hard DPN user (ironic if you know my history with them) and averse to anything that makes me uncomfortable, I successfully avoided the whole deal. Until now. I really love the stitch pattern. After searching to find Judy’s instructions once again and digging out my 2.5mm 40” circular that I bought the last time I thought I would become a Magic Loop expert, I began with some scrap yarn just to see if I could get through the cast on and the toe increases. What do you know, it worked! I won’t say it was “magical” because after having cast on with Magic Loop a few times now, it still feels weird and cumbersome, but do-able. I press on. My next challenge will be getting through a heel. I attempted to work through one with a basic toe-up heel flap recipe I found online, but the instructions seemed ambiguous (or I’m just a doofus) so of course, I muttered under my breath and pulled the thing out again. I then decided that I should just make a pair of toe-up socks from a pattern in my queue to get the process into my head. After all, even though I was avoiding toe-up sock construction, there are lots of beautiful toe-up patterns out there that I’ve saved under the mental category “Someday”. I’ve had these socks in my queue for some time and decided to make them a reality so I cast on and have worked away at them using a skein of Tosh Sock I had on hand but I’m afraid these won’t make it to the heel. My cables are wonky (again - see this post here), which wouldn’t be entirely off-putting since wonky in varying degrees is a part of my every day life, but the sock is just too wide. I’m knitting what the designer calls the “cosplay” version - or ladies version - and without blocking I’m producing a foot that’s 4” wide. That may work for lots of people but I have long, skinny feet (picture short skis) and these just won’t do. I love the Tosh Sock too much to use it for a sock that I won’t wear and I earmarked the yarn for moi, so these will have to go. I could try and adjust the pattern and stitch count, but I’m not sure I’d be happy with the resulting modified pattern. So there you have it. I’m back at square one. Before I sign off, let me ask you sock knitters about heels. When I knit cuff down, I have always used a heel flap construction and I’m happy with that. I think it gives the heel much-needed reinforcement. I’ve seen the alternatives - fish kiss, afterthought, etc. Which heel methods have you used? Which do you love, which do you hate, and why?